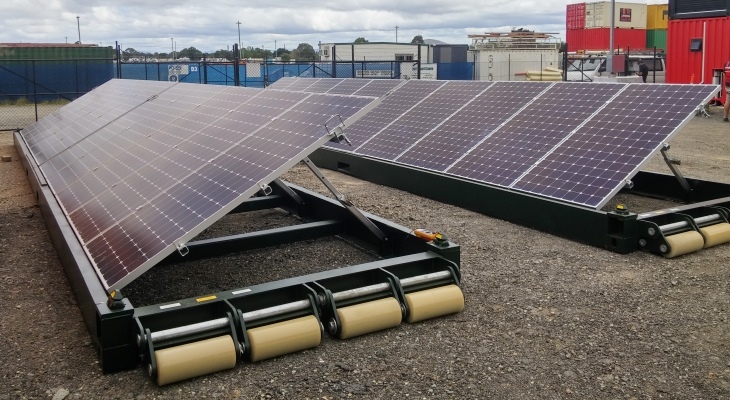 ECLIPS Engineering demonstrated their Container Roll-Out Solar System (CROSS) in Canberra today. These are standard solar panels attached to a hinged framework mounted on a shipping container compatible platform. This can be sued to reduce military fuel use. The demonstration was held at the Canberra drag-strip, normally used for Street Machine Summernats Car Festival. In place of high speed cars there was a forklift which unloaded the solar panels from a shipping container. The system is designed to provide power for military forward bases and mining camps. A stack of platforms is transported to the site in a standard 20 or 40 foot shipping container. The container is stacked with platforms, each fitted with 5 or 10 solar modules. Each platform is slid out, placed on the ground and then the panels hinged up to face the sun. The panels are standard domestic units, mourned to an aluminum frame with standard brackets. While made of glass, the panels are reasonably robust. The steel platform they are mounted on appears heavy enough to keep the panels in place in the strongest wind. This appears a workable system for military use, but may be over-engineered for civilian applications. The platform used is derived from one used for transporting tens of tonnes of supplies. The 20 foot unit weighs more than 1,350 kg, of which less than one quarter would be the panels and their frame. A much lighter platform might be developed to hold the few hundred kilos of solar panels. This would particularly useful for transport by air.